The new Comtech Xicom XTS-50X-B1 block upconverter (BUC) packs the most punch into a 10.5 lb box that's ever been seen at X-band. This compact and highly capable unit provides 50 watts of 1-dB compressed power in a 5.7" x 4.4" 10.6" box that can be antenna mounted. The BUC is designed to handle tough environments and meet the stringent RF requirements of X-band systems. With the advent of new commercial and military X-band systems, significantly more bandwidth is available at X-band. This new capacity is being used to alleviate the severe overcrowding seen on Ku-band systems from Southwest Asia to Europe to North America. The XTS-50X-B1 enables integrators to offer highly compact transportable SATCOM terminals that take advantage of Xstar and WGS to provide much higher data rates than in the past. The XTS-50X-B1 provides more than 32 watts of linear output power as defined for the WGS system in a 10.5 lb self-cooled feedmount outdoor package that operates in tough environments up to 60�C. This high linear output power level is achieved for both single carrier and multi-carrier performance. This unit accepts a 950-1450 MHz L-band input, upconverts it to 7.9 � GHz X-band, and amplifies the signal to achieve the full output power. Its rich feature set includes temperature compensation, gain control, harmonic filtering, tight gain variation and stability, serial RS-232/422/485 digital monitor and control interface, and options for operating from either 20-32 VDC or 35-52 VDC prime power. With this new BUC capability, SATCOM integrators will be able to offer their customers the highest X-band data rates possible in the smallest packages. Now thatÄôs powerful! Comtech Xicom Technology, Inc. was established in 1991 in the heart of Silicon Valley. Xicom provides rugged, efficient and reliable Traveling Wave Tube Amplifiers (TWTAs), Klystron Power Amplifiers (KPAs), Solid State Power Amplifiers (SSPAs), and Block Upconverters (BUCs) for commercial and military applications around the world. A broad array of products are available for fixed locations and mobile platforms. ViaSat Inc. has received delivery orders from PM Force XXI Battle Command Brigade and Below totaling $13.8 million under its Blue Force Tracking 2 (BFT-2) IDIQ contract. These contracts include the installation and test of production satellite ground station and satellite network control center equipment as well as L-band bandwidth leasing, network ground equipment, and thousands of additional production vehicular transceivers. These next generation BFT-2 systems are designed to enable much faster situational awareness updates and higher transmission speeds. Selected to upgrade the US Army and Marine Corps Blue Force Tracking network, ViaSat brings real-time situational awareness and better networking capabilities to the warfighter with BFT-2. ViaSats next-generation Blue Force Tracking transceivers provide dramatic improvements in situational awareness through faster Position Location Information (PLI) refresh rates and greater information throughput features. This BFT-2 system delivers improved network efficiency and reduces the Department of Defenses total operational expenditure for the specified capability. With BFT-2, network users can achieve real-time position accuracy by operating through a Ground Vehicular Transceiver or Aviation Transceiver to one of up to ten satellite channels back to a Satellite Ground Station (SGS). The average round-trip message latency through the network has been demonstrated and proven to be less than 2 seconds. The ViaSat BFT-2 network offers situational awareness updates and increased data throughput. The next generation BFT-2 network is expected to improve situational awareness latency from minutes to just seconds. The new BFT-2 system is derived from ViaSat mobile satellite communication technology, which enables fast, efficient network access using very small antennas. These systems provide communications-on-the-move (COTM) service to both military and commercial customers. The original SuperConductor is used in fixed and mobile applications around the world, including combat simulation, mass notification, emergency messaging, and general military training exercises. Potential applications include playing Reveille daily at 0600, hourly safety announcements, local-language messages, sirens and alerts, combat simulation, training, and ceremonial music for command changes. SuperConductor v2.0 builds on the original playback and scheduling features, adding the ability to schedule recorded field audio for immediate or future playback from the internal sound library. Another key new design feature is Local Configuration Mode, which allows the user front-panel access to all functions, eliminates the need to use a computer for managing sound files, and offers password protection. The unit also integrates an IP-based timeserver that automatically synchronizes the units clock with the timesaver once a day. Integral Systems, Inc.s Military and Intelligence Group (MIG) has achieved an important program milestone. They successfully completed Factory Acceptance Testing (FAT) of the Rapid Attack Identification, Detection and Reporting System (RAIDRS) Block 10 (RB-10) program. The successful testing paves the way for the systems deployment and activation. Integral Systems is the RAIDRS RB-10 program prime contractor. RAIDRS is a ground-based defensive counterspace program. The system will provide near real-time event detection, characterization, geolocation and Electromagnetic Interference (EMI) reporting for critical satellite communications systems, directly supporting combatant commanders. The United States Air Forces 16th Space Control Squadron (SPCS) operates RAIDRS from Peterson Air Force Base, Colorado, and is assigned to the 21st Space Wing. Lubbock County Texas is using Spacenets high-performance satellite communications services and equipment to support critical communications across the state. Spacenets transportable antennas and Connexstar S2 satellite services, based on the SkyEdge II VSAT platform, are being used to provide emergency communications as part of the countys instant command post. Lubbock County integrated Spacenets satellite equipment and services into its mobile command vehicle that is used across the state to maintain data, voice and video communications during emergency situations. The vehicle is one of two primary mobile communications platforms within the region and it can be used as an alternate dispatch point for its jurisdiction in the case of an outage, helping to enable the county to operate normally. The system supports VoIP through telephone systems that connect back to Lubbock Countys telephone numbers. The vehicle was recently used to support a community in Texas that lost its connection to the 911 system due to a cut in the fiber optic lines. The mobile command vehicle rolled into the community and within an hour was able to provide 911 access through its VoIP phones. Harris Corporation has been awarded a 30-month, $42 million contract by Sierra Nevada Corporation to supply antenna and radar electronics for a satellite that will provide military commanders in the field with timely, high-resolution radar imagery of the Earths surface  regardless of weather conditions or time of day. Harris will design, build, and integrate the synthetic aperture radar (SAR) satellite payload for Sierra Nevada as part of NASAs Rapid Response Space Works and Modular Space Vehicles program for the U.S. Department of Defenses Operationally Responsive Space (ORS) Office. ORS is a joint NASA/DoD initiative with the charter to field modular payloads rapidly and inexpensively. The payload architecture, designed to support a new family of modular military satellites, offers flexibility to support multiple missions with minimal changes in the basic design. SAR is the second payload to be developed by the ORS Office and will produce high-resolution radar imagery of the Earths surface, even during darkness or inclement weather. The SATCOM Solutions division of Integral Systems, Inc. has been awarded a $10 million, five-year, Indefinite Delivery/Indefinite Quantity (IDIQ) contract to modernize the United States Coast Guards (USCG) satellite communications (SATCOM) network for the services large cutters. Integral Systems SATCOM Solutions division will act as the prime contractor on the program, transitioning the USCG from its legacy SATCOM network to a commercial-based, advanced Ku-band system, significantly enhancing network reliability, flexibility and scalability. Under the terms of the contract, Integral Systems SATCOM Solutions division will provide an advanced 117MT Ku-band Maritime Antenna System that includes its innovative, electromagnetic compatible (EMC) and electromagnetic interference (EMI) management system. The 117MT fully supports primary off-the-cutter connection to the Coast Guard One Network (CGONE), and provides the ideal ocean-going platform for single channel per carrier or on-demand networks supporting video teleconferencing, virtual private networks, voice over IP and large file data transfers. Northrop Grumman received a salute for having met two major milestones. Northrop Grumman Corporations (NYSE:NOC) Joint Interface Control Officer (JICO) Support System (JSS) received Milestone C approval from the U.S. Air Force November 19. After integration with other air and space operations center systems, JSS will be deployed to as many as 26 Air Force and joint military sites worldwide. In October 2010, JSS achieved two significant milestones needed for final fielding approval. JSS received the Air Forces Certification to Interoperate with U.S. and allied data link networks and was granted an Authority to Operate, permitting JSS to connect with U.S. classified networks. JICOs are officers responsible for planning and managing the critical joint tactical data link networks that aircraft and ground troops use to communicate in combat. JSS allows the JICO to optimally plan, configure, operate, monitor and exchange information among multi-tactical data link networks, using an integrated system of hardware and software. Northrop Grumman is delivering 42 JSS systems, 160 workstations, spares, training and support for fielding and logistics. AeroVironment, Inc. has received an order valued at $46,226,984 under an existing contract with the U.S. Army. The order comprises 123 new digital Raven® small unmanned aircraft systems (UAS) and initial spares packages, as well as 186 digital retrofit kits for the U.S. Marine Corps. The order also includes 339 digital retrofit kits for the U.S. Army. The Raven system and retrofit order represents the remainder of the funds appropriated for RQ-11B Raven system procurement in the 2010 Department of Defense Appropriations Act, which was signed into law in December 2009. The orders were released under the existing U.S. Army joint small UAS program of record for AVs Raven. This program has included contract additions from the Army, Marine Corps and Special Operations Command. The items and services provided under these awards on this multi-year contract are fully funded. Work is scheduled to be performed within a period of 12 months. The Raven unmanned aircraft is a 4.2-pound, backpackable, hand-launched sensor platform that provides day and night, real-time video imagery for over the hill and around the corner reconnaissance, surveillance and target acquisition in support of tactical units. The MILSATCOM Systems Directorate has awarded a cost-plus-incentive-fee contract modification valued at approximately $1.4 billion to Lockheed Martin Space Systems, Sunnyvale, California, for production of the fourth Advanced Extremely High Frequency satellite. The production contract includes manufacturing, integration and test of the fourth AEHF space vehicle. The satellite is contracted to be available for launch in 2017. AEHF-1 was launched on Aug. 14, 2010, out of Cape Canaveral Air Force Station, Florida, and is currently in an orbit-raising phase. AEHF-2 has completed production and is in storage until its scheduled launch in 2012. AEHF-3 is undergoing Thermal-Vacuum Testing and is on track to complete production in 2011. AEHF is the successor to the five-satellite Milstar constellation and will provide ten times greater global, highly secure, protected, survivable communications capability for warfighters operating on ground, sea and air platforms. 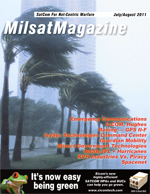 The MILSATCOM Systems Directorate executes an annual budget of over $2.4 billion as it plans for, acquires and sustains space-based global communications. ARINC Engineering Services, LLC has retained its key role as Technical Support provider to USSTRATCOM for the joint planning and management of Satellite Communications (SATCOM) resources of the U.S. Department of Defense. Under a follow-on Air Force contract recently awarded, ARINC will continue support and development work on the Joint Satellite Communications Management and Planning System (JSMPS) and the related Joint Integrated SATCOM Tool (JIST). The follow-on award is for a one-year base, four one-year options, and one additional option period. JSMPS is the hub of a net-centric suite of DoD databases and applications, providing global mission management of SATCOM resources. The JIST tool is intended to manage satellite access for DoD stakeholders through a request and authorization process. JSMPS/JIST is being matured into a web-enabled database and application suite for use by all DoD SATCOM stakeholders. It will also provide a robust and secure environment for collaborative Electro-magnetic and Radio Frequency Interference (EMI/RFI) detection, tracking, analysis and mitigation. Soon to come to Afghanistan is a revolutionary airborne surveillance system called Gorgon Stare, duly named after the Gorgon, a mythical Greek creature whose unblinking eyes turned to stone anyone who looked at him. Now the Air Force has a new drone that can see everything, and will transmit live video images of physical movement across an entire town. Gorgon Stare is a nine video camera system mounted on an aircraft that is remotely operated and is capable of transmitting live video images of physical movement across any town. The system can transmit live video images to soldiers on the ground or to analysts tracking enemy movements, and sends as many as 65 various images to different users. This in comparison to todays UAV single camera that provides video from a single camera over a soda straw area the size of a building or two. Contrarians question whether the military will be able to sort through enormous amounts of imagery in time to actually be helpful to troops in the field. Officials also agree that Gorgon Stare is of limited value unless they can match it with improved human intelligence  eyewitness reports of who is doing what... on the ground. Harris Corporation has been awarded an Indefinite Delivery, Indefinite Quantity (IDIQ) contract with a potential total value of $475 million to supply military and land mobile radio systems to international partners of the U.S. State Department and U.S. Department of Defense. The five-year contract, awarded by the U.S. Armys Communications Electronics Command (CECOM), certifies Harris as a provider of radios, accessories, communication systems and services to assist U.S. partners with their tactical communication needs. The contract is part of the U.S. governments Foreign Military Sales program, which support coalition building and interoperability through sales of defense equipment, training and services. The contract covers the Harris RF Falcon II® and Falcon III® radio portfolio, such as the RF-7800M Multiband Networking, and RF-7800S Secure Personal radios, as well as public safety and professional communications land mobile radios. Fire-X, a vertical unmanned air system (VUAS) developed by Northrop Grumman Corporation (NYSE:NOC) and Bell Helicopter, a Textron company (NYSE:TXT), completed its first fully autonomous flight Dec. 10 at Yuma Proving Ground, Ariz., less than one year after development began. First flight involved a short-duration hover to validate safe and reliable autonomous flight. Additional flight tests and reliability data gathering will be conducted in the coming weeks. Integration of ISR sensor payloads and cargo carrying capability test flights is set to occur early next year. First flight was accomplished in 11 months after development began. It was achieved by integrating Fire Scouts proven autonomous systems developed for the U.S. Navy with the highly successful Bell 407 helicopter, a FAA-certified helicopter thats been in commercial service worldwide since 1996. The 407 system can carry ISR sensors and a useful load of more than 3,200 pounds  for fuel, payloads and/or enhanced cargo hauling capabilities  internally or externally. Fire-X will also be able to conduct ISR missions up to 16 hours in endurance and various cargo missions in support of U.S. Army and Marine Corps requirements. The Joint Tactical Radio System, or JTRS, is transitioning from research and development, to production and delivery to Soldiers in the field. Providing cyber-hardened Internet Protocol networking on fluid, rough terrain battlefields, JTRS radios seamlessly interconnect air, ground, maritime and space platforms and networks in a multi-band, multi-mode capability to the individual Soldier. The Soldiers personal C2-on-the-move communications network capability, located in a single box that acts like a mobile cell tower and router, operates in a deployable, mission-programmable, worldwide spectrum. Without JTRS, net-centric warfare, quite literally, stops at the command center. With JTRS products, every warfighter is connected to every other warfighter. Todays Soldier can look forward to a personal communication support package that is lighter, self-contained, and cannot be hacked; has longer lasting batteries, and is able to transmit and receive at distances previously unimagined in a net-centric capability, at battlefield locations previously unreachable by legacy technologies. JTRS software-defined architecture increases network security as threats evolve, while providing position location information to the Soldier as real-time situational awareness is passed to the company level and below. Soldiers are safer, smarter and always in touch. The convoy does not lose contact with battalion headquarters. JTRS products immediately go to work establishing a communications system and link throughout the entire convoy. For the first time, the network now moves with the individual Soldier, rather than the Soldier having to move with the network. All operational and tactical data are at the Soldiers disposal, not pre-empted or interrupted by traditional communication limitations. With JTRS, the battlefield is truly networked and every Soldier is connected in a safe, secure communications nerve system where they need it most: at the tactical edge. For the first time, Warfighter Information Network-Tactical Increment 2 will bring mobility to the Armys tactical network down to the company level. It will eliminate the need to stop to communicate, increasing maneuver speed on the battlefield and allowing Soldiers and commanders to stay connected at all times. WIN-T Increment 2 is the early introduction of mature on-the-move technology. Its mission is to successfully deliver a self-forming, self-healing mobile communication infrastructure to Army combat units down to the company level, giving commanders the ability to communicate seamlessly on the move, and providing a solid foundation of program management and systems engineering for the increments that follow. A key strength of WIN-T is its ability to adapt to changing battlefield conditions in real time, without the pre-planning and configuration required of traditional enterprise networking infrastructure. It enables network mobility by employing military or commercial satellite connectivity and line-of-sight radios and antennas, to achieve end-to-end connectivity and dynamic networking operations. Increment 2 maintains a constantly viable self-healing network by providing instant alternate connections in the event its connection is broken. As the vehicles that carry the mobile network move in and out of areas of blockage or beyond normal range of connectivity, the network will automatically adapt, allowing for continuous communications between Soldiers. From division down to battalion, Increment 2 will provide an OTM line-of-sight radio known as the Highband Networking Radio. This new radio will greatly increase line-of-sight capacity and ease of use. With the help of smart multi-beam antenna technology, the HNR can automatically detect all other HNR radios within range and allow users to pass video, voice or Internet Protocol data traffic to and from each other. The Program Manager WIN-T has started equipment production for its initial operational test in the first quarter of fiscal year 2012. The first unit equipped is expected by the second quarter of fiscal year 2012. WIN-T Increment 3, which is still in development, will provide the air tier, using an advancement of the HNR radio, known as the Joint Command Control Communications and Computers Intelligence, Surveillance and Reconnaissance Radio, or JC4ISR, mounted on unmanned aircraft. The warfighter will possess a three-tiered communication network providing connectivity for the full spectrum of operations.